On the Firefox team, one thing we always hear from our users is that they rely on the web for complex tasks like trip planning and shopping comparisons. That often means having many tabs open. And the sites and web apps running in those tabs often have lots of things going on– animations, videos, big pictures and more. Complex sites are more and more common. The average website today is nearly 2.5 megabytes – the same size as the original version of the game Doom, according to Wired. Up until now, a complex site in one Firefox tab could slow down all the others. That often meant a less than perfect browsing experience. To make Firefox run even complex sites faster, we’ve been changing it to run using multiple operating system processes. Translation? The old Firefox used a single process to run all the tabs in a browser. Modern browsers split the load into several independent processes. We named our project to split Firefox into multiple processes ‘Electrolysis ’ (or E10s) after the chemical process that divides water into its core elements. E10s is the largest change to Firefox code in our history. And today we’re launching our next big phase of the E10s initiative. With today’s release, Firefox uses up to four processes to run web page content across all open tabs. This means that a heavy, complex web page in one tab has a much lower impact on the responsiveness and speed in other tabs. By separating the tabs into separate processes, we make better use of the hardware on your computer, so Firefox can deliver you more of the web you love, with less waiting. I’ve been living with this turned on by default in the pre-release version of Firefox (Nightly). The performance improvements are remarkable. Besides running faster and crashing less, E10S makes websites feel more smooth. Even busy pages, like Facebook newsfeeds, spool out smoothly and cleanly. After making the switch to Firefox with E10s, now I can’t live without it. Firefox 54 with E10s makes sites run much better on all computers, especially on computers with less memory. Firefox aims to strike the “just right” balance between speed and memory usage. To learn more about Firefox’s multi-process architecture, and how it’s different from Chrome’s, check out Ryan Pollock’s post about the search for the Goldilocks browser. 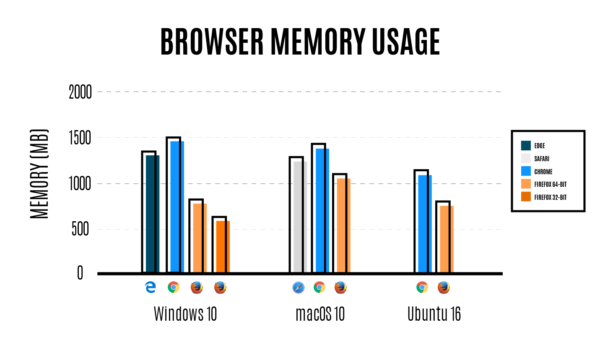 In our tests comparing memory usage for various browsers, we found that Firefox used significantly less RAM than other browsers on Windows 10, macOS, and Linux. (RAM stands for Random Access Memory, the type of memory that stores the apps you’re actively running.) This means that with Firefox you can browse freely, but still have enough memory left to run the other apps you want to use on your computer. This is the best release of Firefox ever, with improvements that will be very noticeable to even casual users of our beloved browser. Several other enhancements are shipping in Firefox today, and you can visit our release notes to see the full list. If you’re a web developer, or if you’ve built a browser extension, check out the Hacks Blog to read about all the new Web Platform and WebExtension APIs shipping today. As we continue to make progress on Project Quantum, we are pushing forward in building a completely revamped browser made for modern computing. It’s our goal to make Firefox the fastest and smoothest browser for PCs and mobile devices. Through the end of 2017, you’ll see some big jumps in capability and performance from Team Firefox. If you stopped using Firefox, try it again. We think you’ll be impressed. Thank you and let us know what you think.